Villa Verdi is part of a spacious residence. 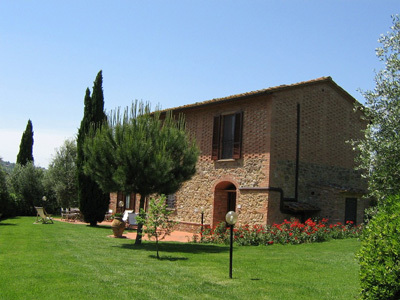 3 other villas and an apartment are also part of the residence that is set among the green hills of the Tuscan countryside, 3 km away from the small medieval town of Montaione. The property is surrounded by a very large, charming garden. The whole structure has been recently restored and carefully and elegantly decorated. The Villa is equipped with modern amenities including Satellite TV, dishwasher, and Jacuzzi bathtub. Outside guests can relax by the pool. The Residence area is enclosed by an automatic gate for guests’ privacy and security. Guests who want to alternate relaxing time with activities won’t be disappointed as the area around Montaione offers many possibilities. Near the Villa guests can experience golfing, horseback riding, mountain biking and wine tasting. In addition here are many interesting towns and villages to explore such as San Gimignano, San Miniato and Volterra. Florence, Siena, Pisa and Lucca are reachable in less than 1 hour. We suggest guests visit the town of Montaione, with its medieval history and the church of San Regolo which houses the “Madonna del Buon Consiglio” – a painting that dates to the 13th Century and was painted by a follower of Cimabue. Also worth mentioning is the monastic complex of San Vivaldo and its Holy Mount, just 5 Km far from Montaione. There, a series of small chapels transforms the monastery into a smaller copy of Jerusalem during the time of the Crusades. The Residence is set among the green hills of the Tuscan countryside, 3 km away from the small medieval town of Montaione. Montaione is an ideal place for visiting Tuscany as many famous Tuscan towns such as Florence, Siena, San Gimignano, San Miniato, Volterra, Pisa and Lucca can be quickly and easily reached. Near the Villa guests can experience golfing, horseback riding, mountain biking and wine tasting.